Paying a visit to Greenock in September 2003 was Cunard Lines' CARONIA. Now a member of the Saga fleet, she started life in 1973 as Norwegian America Lines' VISTAFJORD, carrying up to 850 passengers across the North Atlantic. In 1980 she, together with her 'sister' SAGAFJORD, passed to Norwegian American Cruises, joining the Cunard fleet three years later. She retained her original name until 1999, when she became CARONIA. 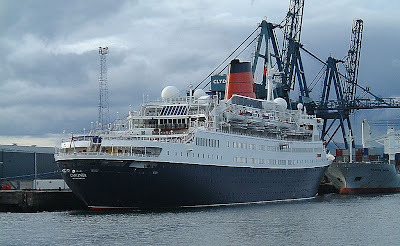 Sold to Saga Cruises in 2003, she remained on charter to Cunard for two more years, before becoming SAGA RUBY. Of 24,492 gross tons, this attractive ship is 191.08 metres long, and was built at the Swan Hunter shipyard on Tyneside.